Based on true ghost stories and legends, the Crawford Farm Ghost Tour will take you on an intimate journey onto the actual property of one of the most feared and twisted families of the late 19th century. The true story of love, loss and one man’s willingness to blur the borders between life and death have haunted generations. After losing his beloved wife during the birth of their second child, an old Civil War veteran, Elijah Crawford, turned to the dark arts to find her. His obsession to find his lost love turned south and a string of tragedies began to fall upon the farm, as one by one those close to him started experiencing horrific life changing (and some life ending) events. The land was cursed and casts a dark shadow even today. 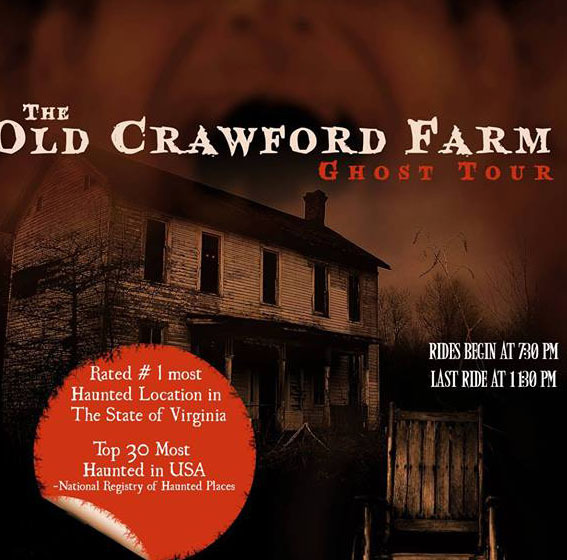 Recently voted one of the Top 30 scariest grounds in the nation by the National Registry of Haunted Places, The Crawford Farm is a historic landmark in Appomattox, Virginia. Set in the ghostly woods of the farm, this guided tour is in its seventh year and is produced and conducted by Wolfbane Productions. Whether you are a paranormal expert of Halloween aficionado, The Crawford Farm Ghost Tour will thrill and chill you. Tour dates are October 19-21, 2017. Tours start at 7:30 pm and run until 11:00 pm. Tours are approximately 30 minutes. Tickets are sold at the door for $10. Tickets are sold first come, first served, starting at 6:30 pm each evening. Dress warmly and wear comfortable shoes, as you will be walking through the woods. Tours are not recommended for children under 12. **Information taken from the Wolfbane Productions web site. The Carriage House Inn Bed and Breakfast is located 20-25 minutes from Appomattox. After a scary Ghost Tour come back and relax here. Click for reservations.